The finance minister says talks should be kept behind closed doors. Finance Minister Bill Morneau gestures during a news conference on Parliament Hill in Ottawa on Oct. 19, 2017. Project architect Kinder Morgan upped the ante this week by declaring it would suspend all non-essential spending on the project until there is more certainty it won't be blocked by British Columbia's NDP government. Morneau says any federal investment in the pipeline would first require closed-door talks with Kinder Morgan and the two provinces. The finance minister is expected to meet later today with Alberta Premier Rachel Notley, and says he plans to reinforce the Trudeau government's "resolute determination" to keep the project on track. He says that determination was confirmed Tuesday during an emergency federal cabinet meeting in Ottawa, although he won't say whether penalizing B.C. financially — such as by withholding transfer payments —remains an option. 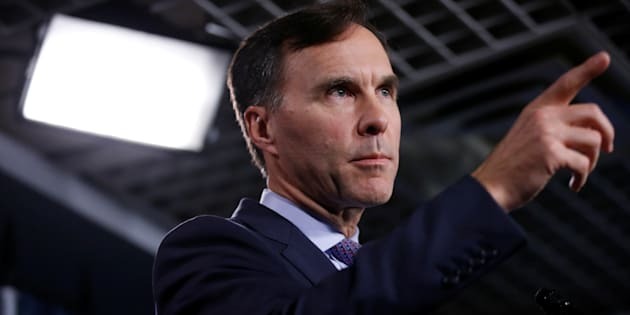 "I'm not going to publicly negotiate with any one of the parties," Morneau said after making a student work placement announcement at Toronto's Ryerson University. "Public threats, in my estimation, aren't helpful."